Responding to the effects of human mobility and crises such as depleting oil supplies, Ehren Helmut Pflugfelder turns specifically to automobility, a term used to describe the kinds of mobility afforded by autonomous, automobile-based movement technologies and their ramifications. Thus far, few studies in technical communication have explored the development of mobility technologies, the immense power that highly structured, environmentally significant systems have in the world, or the human-machine interactions that take place in such activities. Applying kinaesthetic rhetoric, a rhetoric that is sensitive to and developed from the mobile, material context of these technologies, Pflugfelder looks at transportation projects such as electric taxi cabs from the turn of the century to modern day, open-source vehicle projects, and a large case study of an autonomous, electric pod car network that ultimately failed. 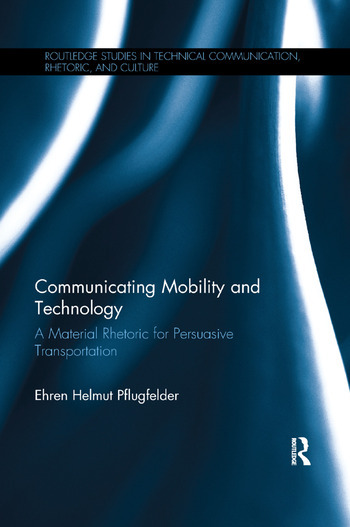 Kinaesthetic rhetoric illuminates how mobility technologies have always been persuasive wherever and whenever linguistic symbol systems and material interactions enroll us, often unconsciously, into regimes of movement and ways of experiencing the world. As Pflugfelder shows, mobility technologies involve networks of sustained arguments that are as durable as the bonds between the actors in their networks. Ehren Helmut Pflugfelder is Assistant Professor of Professional, Technical, and Scientific Writing in the School of Writing, Literature, and Film at Oregon State University, USA.